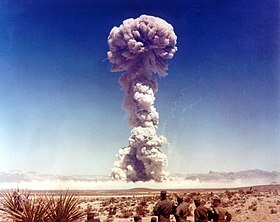 Operation Buster–Jangle was a series of seven (six atmospheric, one cratering) nuclear weapons tests conducted by the United States in late 1951 at the Nevada Test Site. Buster-Jangle was the first joint test program between the DOD (Operation Buster) and Los Alamos National Laboratories (Operation Jangle). As part of Operation Buster, 6,500 troops were involved in the Operation Desert Rock I, II, and III exercises in conjunction with the tests. The last two tests, Operation Jangle, evaluated the cratering effects of low-yield nuclear devices. This series preceded Operation Tumbler-Snapper and followed Operation Greenhouse. Personnel were instructed to create foxholes, construct gun emplacements and bunkers in a defensive position 11 km south of the detonation area. After the nuclear bomb was detonated, the troops were ordered to move forward towards the affected area. While traveling closer to ground zero, troops witnessed the nuclear weapon's effects on the fortifications that were placed in the location in preparation for the tests. The ground troops got as close as 900 meters from ground zero before they were instructed to move out of the area. The Human Resources Research Office was tasked with gathering data on the psychological experiences of the troops after witnessing such a detonation and moving closer towards the affected area. For the Operation Buster–Jangle series of tests, the Atomic Energy Commission created a set of criteria that must be followed if exposing armed forces, or civilians to the harmful effects of ionizing radiation. A majority of the personnel that took part in the exercise received around 3 R, with pilots receiving an average of 3.9 R. These estimates vary given the differing data provided by the Department of Defense over the years. weapons development Mk-6 "Petite Plutonium" 0 kg  Minimum mass design, fizzle (yield "less than a pound"); yet it yielded a lower bound on viable plutonium mass. October 19 attempt failed due to control wiring problem. weapons development Mk-4 "LT" 3.5 kt I-131 venting detected, 600 kCi (22,000 TBq)  No uranium tamper. weapons development Mk-4 "NF" 21 kt I-131 venting detected, 3.1 MCi (110 PBq)  Desert Rock I, no fallout (air burst). Troops trucked into defensive emplacements from 6 mi (9.7 km) observation point, held maneuvers. weapon effect Mk-6 "Johnny" 1.2 kt I-131 venting detected, 170 kCi (6,300 TBq)  "Surface" shot, only true surface shot in NTS history. Desert Rock II; maneuvers conducted at a distance due to dirtiness. weapon effect Mk-6 "Frankie" 1.2 kt I-131 venting detected, 170 kCi (6,300 TBq)  Cratering shot, meant to simulate 23 kt ground penetrating weapon. Desert Rock III, observed at 5 mi (8.0 km), kept distance in maneuvers. 5000 R/Hr near GZ one hour after shot. Wikimedia Commons has media related to Operation Buster-Jangle.